Yesterday, I asked for your thoughts on self-leadership. Here’s how I define self-leadership: if leading others is a moment when a person steps into awkward or uncomfortable space with others in order to create positive change, then leading self means taking a step into awkward or uncomfortable inner space , me with me space, in order to achieve the same result. We have all experienced such times. Personally, they usually represent a moment of self-confrontation that tests my capacity to look squarely at myself with honesty and compassion, to see what is. Second, such moments typically require some form of change on my part. So first, looking, and then, changing. 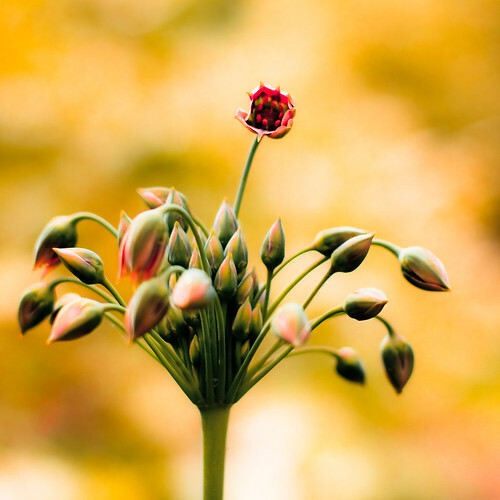 Thanks for reprinting part of our conversation — and it’s a great flower shot! I love the caption…. I liked it too… The photographer writes that he was torn between that title and “Up periscope” and I think it’s quite cool the way that either title is so perfectly suggestive.